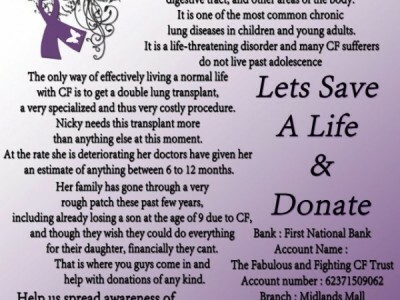 Cystic fibrosis is one of the more common life-limiting genetic diseases in South Africa. It is caused by the inheritance of at least two mutations of the cystic fibrosis transmembrane conductance regulator (CFTR) gene and is found in all of South Africa's diverse population groups. While incurable at present, its symptoms are amenable to good control when it is diagnosed early and managed appropriately, with the potential for a good quality of life into adulthood for many years. Answers to some of your possible questions. Find out more about newborn screening and what it means for your baby.